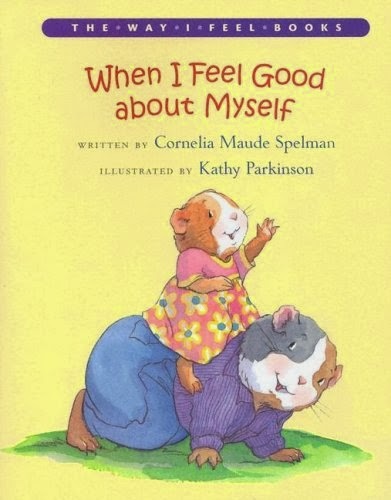 When I Feel Good About Myself talks about how the main character, a young girl hamster, feels good about herself even though she is not like everyone else. While the young girl does not look like those around her or have the same talents as her peers, she is still valued by her friends and family. The hamster talks about it is okay to be different and also discusses what activities make her feel good including making new friends or learning new things. The main character says how people like her just the way she is and being herself is all she needs to feel good. When I Feel Good About Myself represents the first element about self-love and knowledge because it allows students to see that even though you are different, you are still valued. It also lets anyone reading this book to think about what makes them feel good. Being unique does not always mean you are the best at everything which is reflected in this text as well. Appreciating the talents you possess is an important step towards truly loving yourself. To incorporate this book into the classroom, I would first read the book to my students. Then I would promote an open discussion with my students to reflect on what makes them feel good about themselves. I would also ask them why is important that we are not all the same. I would then have a worksheet that said "I feel good about myself when..." and have the students finish the sentence. There would be a section at the top to allow the student to draw them doing this action. After these worksheets were handed in, I would create a booklet for our classroom library so the students could learn about their classmates and help promote self-love and knowledge throughout the class and school.